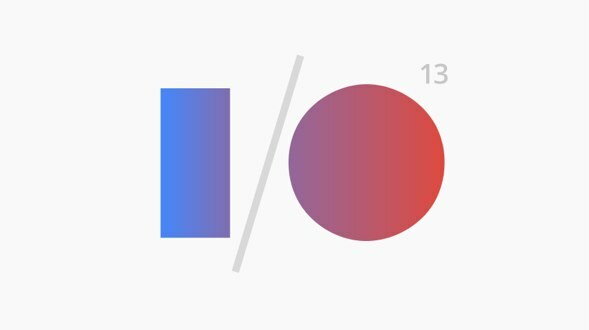 Today was Day 1 of the Google I/O Conference, where they discuss new features and plans for 2013. Let’s just say, they started today off with a bang, talking about everything from Android, to Google+, Chrome, and Google Maps. I’ll try to provide a roundup of the announcements made today. First on our list is the Google Play store. 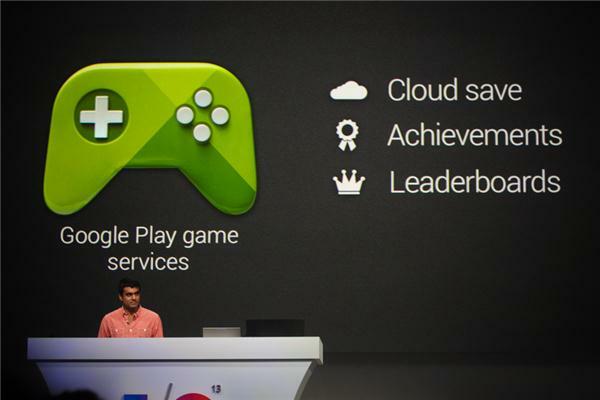 Google is trying to make gaming a better experience while mobile. One enhancement they’re rolling out is the ability to cloud save, meaning your progress in your games will be synced up with the cloud so you can resume on any device that supports it, from your phone to your tablet. This feature will be available for Android and iOS. They will also offer an Apple Game Center-like service which includes leaderboards, achievements, and match making. You’ll need Android 2.2 or higher. The early developers include: Gameloft, Glu, Ironhide Games, and Miniclip. 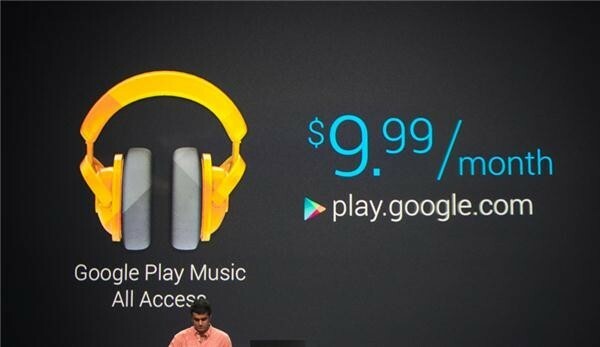 Next up is Google Play Music All Access, which is a streaming service tied into Google Music and Google Play. The service will run $9.99/month, offer a 30-day free-trial, and if you sign up before June 30th, you’ll get it for $7.99/month. The service launches today in the U.S. and additional countries are coming soon. This will put them into competition with Pandora and Spotify and the rumored upcoming Apple iRadio. For those of you who like the stock Google Nexus phones, they’ll be offering up a Samsung Galaxy S4 for T-Mobile and AT&T. They’ll be 16GB, LTE, and come with an unlocked bootloader. You can purchase the phone from the Google Play Store starting June 26th for $649. The Google+ news stream will be redesigned starting later today with a card-like interface (similar to Pinterest). It will have an automated system that will insert hashtags into your post (up to 3 per post), which users can remove or change later. The new interface will be the same whether you’re viewing it on the desktop, tablet, or phone. Photos will also have enhancements, such as automatic filters and hashtags. 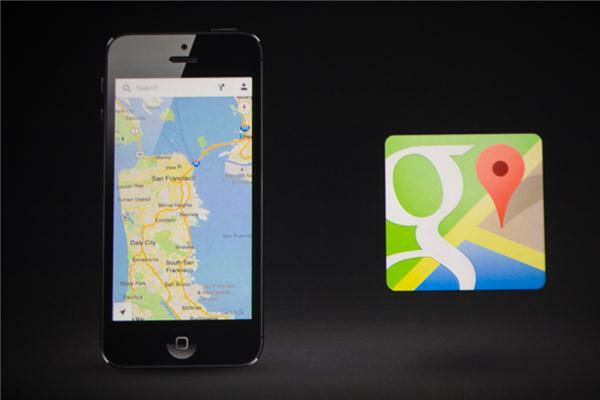 Google will be revamping its Google Maps interface on the web, Android, and even iOS. You can sign up for an invite here for the web version. The mobile versions will feature deeper integration with review service Zagat, built-in offers from participating businesses, an “explore” feature, and dynamic re-routing during navigation if there are accidents in the way. The new Google Maps will be available later this summer. 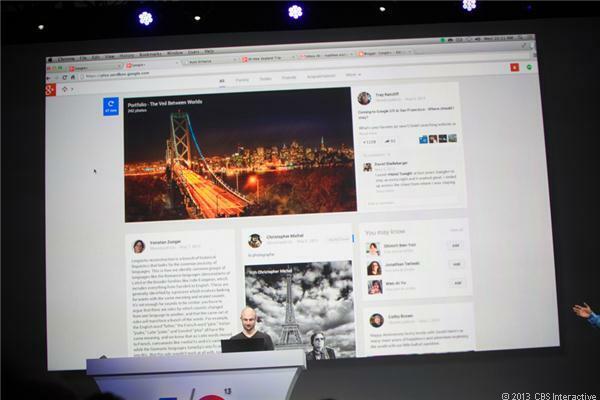 Google+ Hangouts is becoming more integrated and is offering more features starting today. Instead of just offering group chat, it is now taking a Google Talk approach and is offering one-on-one chat. In fact, http://www.google.com/talk now redirects to Google Hangouts and offers a download for Android, iOS, and desktop (through the Chrome browser). Google has also added a way to go back and see the entire history of a conversation, including text and photos. This can be turned off or cleared, though Google is pitching it as a way for people to quickly get up to speed on a group chat they might not have been a part of, and to pull up old entries. Other additions include photos and emoji, and a back-end change that will get rid of notifications for a Hangout invite on other devices if you’ve accepted an invite elsewhere. 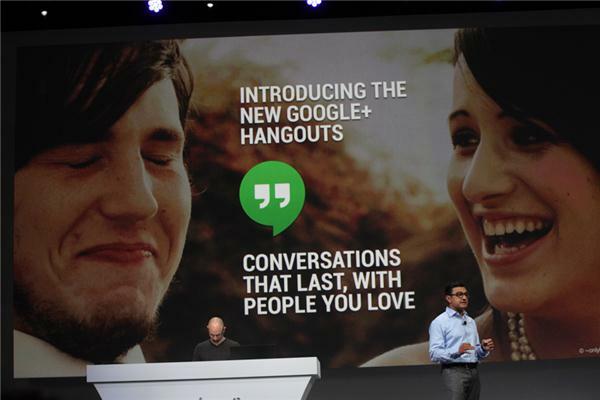 The new Google+ Hangouts will be the first time Google has offered a chat client for iOS. I’ve used it a little today and so far it seems to be working pretty well. Google is offering a lot of services to iPhone users but is definitely leaving the Windows Phone crowd out in the cold!